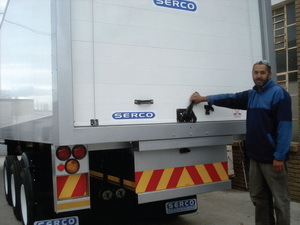 Abdul Sher Ally from Serco operating one of the new roll over doors. The advantages of a new insulated roll over door which Serco introduced impressed Freshmark to the extent that an order of 41 new trailers for Shoprite Checkers will have the new insulated roll-over door fitted. On top of that, SPAR has also ordered three of the new doors to test and there are more orders for the same from other companies in the pipeline. Serco technical director, Denri Gottemaker, says it proved difficult to source a quality roll over door locally so they cast the net wider and sourced a tried and tested solution from overseas which Serco is importing in kit form to be assembled locally. Serco has also arranged for a basket of spare parts which will be available in support of the product including seals, hinges and accessories. Gottemaker says the previous roll over doors used were not very durable making them problematic and high maintenance. The new doors are more durable and have a higher quality standard. “Also, double rear doors open outwards which makes them prone to damage, especially as they are often not latched properly’. There is also the advantage where the roll over door can be easily closed and sealed for improved security without having to move the vehicle away from the loading dock once loaded. This reduces the shunting required. “With these doors, Serco is now able to offer a high quality practical solution to the refrigerated transporter,’ says Gottemaker.